The knee is the largest joint in the human body. It is a hinge type joint made up of a complex network of bones, ligaments, muscles, tendons and cartilage which all work together to make the knee flexible and functional. The knee joint is made up of three bones. Your femur (thighbone) sits on top of your tibia (shinbone). 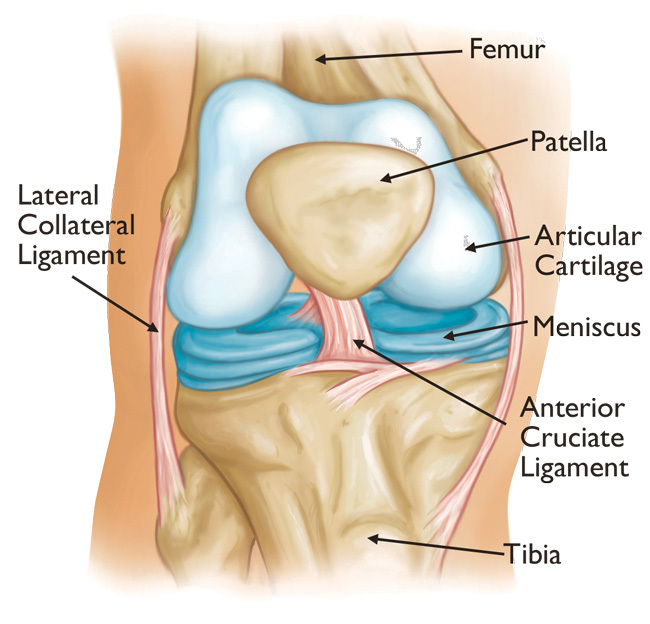 The third bone is the patella also more commonly known as the kneecap. The patella is attached to the muscles thus allowing you to straighten your knee. The ends of these bones are covered in cartilage a smooth substance that protects the bones and allows them to move easily. The ligaments lie along the sides and back of the knee holding the bones of the knee joint in place. These ligaments work together with the bones, muscles and tendons allowing you to straighten and bend your knee. Bursae which are fluid filled sacs cushion the area where skin or tendons glide across bone. The lining of the knee known as the synovium secretes a clear fluid called synovial fluid which helps to lubricate the joint and reduce friction due to movement. The most common cause of knee pain is Osteoarthritis. Osteoarthritis is a degenerative disease that causes the cartilage in your joints to break down and wear away. This results in bones painfully grinding against one another and can be felt particularly when walking, climbing stairs, bending etc. Factors which lead to the development and progression of Osteoarthritis (OA) include age, obesity, joint injuries and genetics. Although there is no cure for OA early diagnosis and treatment play a crucial part in preventing or slowing damage done to the joints. In the early stages of knee arthritis simple treatments such as pain relieving medications, weight loss and exercise programs may be of benefit. If the disease progresses more invasive treatments may be necessary. These treatments may include lubricant injections into the knee joint. The injections contain hyaluronic acid-the natural lubricant which is made by all human joints. These injections are given as a course of three injections into the knee joint. Patients may walk and mobilize freely after the injections with no restrictions and may drive straight away with no restrictions on their activity levels. If simple measures are ineffective you may want to discuss knee replacement surgery with your doctor. If the pain in your knee is preventing movement, disturbing sleep or impairing your ability to walk and do your daily activities then knee replacement may be suitable for you. At Mayo Medical Centre we have pioneered a Rapid Recovery process which allows full weight bearing within a few hours of the surgery and independent walking with crutches on the same day. Most patients only require 2-3 days in hospital after modern Rapid Recovery knee surgery. Surgery is usually carried out under epidural anaesthesia although most patients will also chose to be asleep during the procedure. During the surgery the knee joint is opened and the surface of the lower femur (thighbone) and the surface of the tibia (shinbone) are removed and replaced with artificial metal and plastic components. The Rapid Recovery process pioneered at Mayo Medical Centre allows full weight bearing within a few hours of the surgery and many patients can regain a 90 degree bend in their knee within a few hours of the operation taking place. A proper physiotherapy program is essential after Total Knee Replacement surgery. We recommend that patients should only attend a chartered physiotherapist. The team of chartered physiotherapists at Mayo Medical Centre specialise in the rehabilitation of knee and hip replacement patients. By 12 weeks after the surgery there are no restrictions at all on the patient’s activity level.